← Photos from the third week of May. something (three–or is it four, things!) blue. Momma robin has kept these beautiful eggs warm and cozy all night through some frigid wind and violent rain. It’s thunderstormed and temperatures have been way below normal, but these eggs are warm and dry. Look at those pretty robin's eggs nestled among the honeysuckle. What a lovely little spot for a nest. This entry was posted in Critters, Bugs & Birds and tagged american robin, birds eggs, eggs, nest, robin, robins eggs, robins nest. Bookmark the permalink. I think there may be a fourth egg hidden by a leaf. 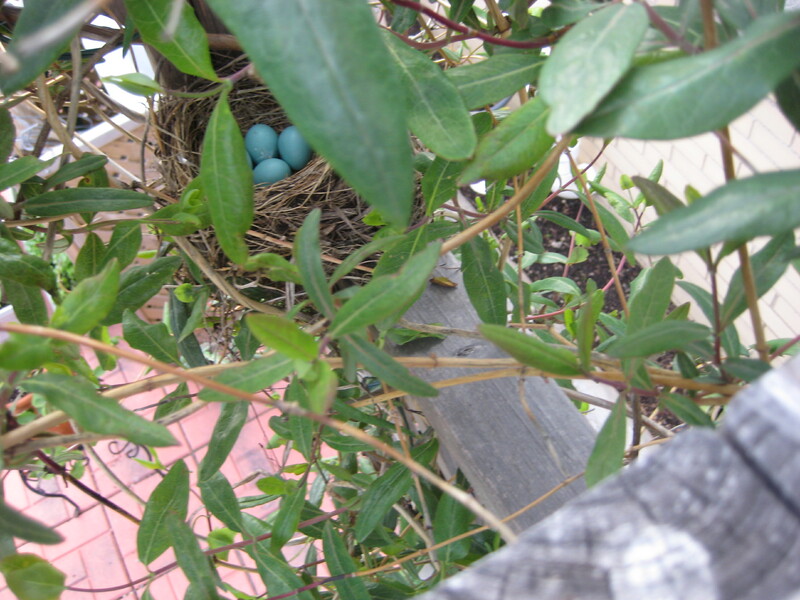 I will try to get a better photo… though that momma robin almost never leaves the nest! May that momma bird be blessed with little tweeters soon. What a perfect photo! After the winter that you endured, the sight of the honeysuckle & eggs – in the nest that the birds made all by themselves – …………..truly a miracle! The color of the eggs is so beautiful! Love this pic! You really have a great eye for photography. How darling. I wonder why God made their eggs so bright? You would think he would want to camouflage them. Sadly, I found one of the eggs broken on the grass this morning. Had my son check it out and now there are three eggs in the nest.